Ann marie Houghtailing has been creating her own opportunities since she launched her company in January 2009, despite the economic downturn with nothing more than a Macbook, $5 and a truckload of tenacity. Houghtailing?s revolutionary philosophy that selling and business development could be elegant drew the attention of corporations and individuals alike who were hungry for an innovative approach to revenue generation. Since 2009, Houghtailing has partnered with a private university to launch an Institute for Sales and Business Development, founded The Millionaire Girls? Movement and toured her one-woman show, Renegade Princess. 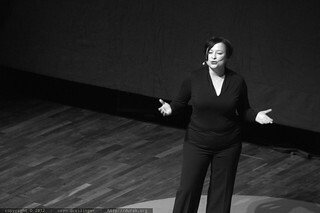 view Ann Marie Houghtailing - Making Good Men - TEDxSanDiego 2012 on a black background.